The ongoing project Landscape Acquisition (2012–) is a multidisciplinary exercise in the collision between familiar vocabularies of airborne surveillance and the Western aesthetic history of beauty in nature. 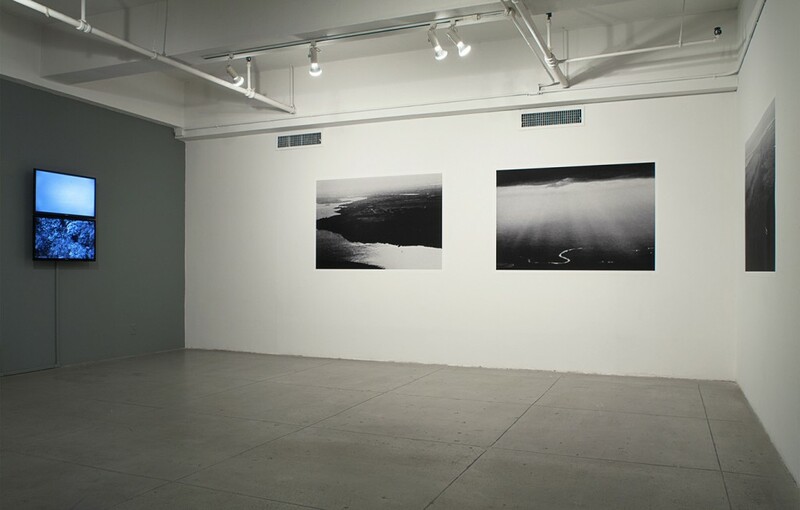 Several approaches are necessary to address these contradictory subject matters, which include video footage shot via cameras mounted to a scale model RC (radio-controlled) drone, appropriated and rephotographed stills of actual surveillance missions, and newly constructed archive images used to reorient those histories, to name a few. These are playful processes that work to filter and distill the technological image into its essentially discernable condition as an abstract object, one that is loosely attached to its referent and purified of its responsibility to depict concrete realities. Through a series of substitutions and organizations, I interrogate these image histories to create a lopsidedness that points directly to the intrinsic connections between them. One is planted on the side of violence, caused by the ever-present sensation of being watched from above without notice. The other stands with the age-old conception of beauty in nature, inherited from painting, carried through to its conclusion by technological imagery, and expressed through the kitsch languages of computer desktops, postcards, calendars, and the like. The seeming incompatibility of this binary addresses cultural dependence on certain image types to express specific conditions of experience. It is here that the possibility of connecting paradoxical image languages might emerge as the very nature of banality. The installation for Distant Images, Local Positions combines a 2-channel video made with a radio-controlled, scale model RQ-1 Reaper drone with three photographs sourced from US military surveillance missions of unknown origin and destination. The stills, Untitled 1-3 (Spies in the Sky), deal directly with the familiarity of the picturesque in landscape representations, while the video piece, 3 Surveys, is seen roving only an unidentified geographic space, absent of any discernable subject. A gray wall surrounds the stacked monitors to create a neutral space wholly dependent on an imposing tonality, which works to deny the footage any singular subjectivity. The innocuousness of the sky and land is given full reign over content and pushes itself toward the more comforting, beatific imagery on the adjacent wall. But these images are not without their consequences either. Using familiar tropes of the sublime in landscape aesthetics, these images are soaked in film grain and point to another, archaic form of surveillance while addressing ideas of beauty in nature. The subject in both instances is simultaneously denied and confirmed through fully recognizable ideals of geography and power. Such ideological languages are stabilized by the cultural expectations of their content, while I create conflict in each by foregrounding their opposites as a way to examine and frustrate social expectations of the familiar image types on display. Wiener (b. 1977 – Baltimore, MD) spent his early life traveling from one military base to another, never spending more than four years in one place at a time. The work he makes is a direct result of an impossible attempt to hold onto time and place – to stabilize it. He proceeds accordingly by using lens-based media to produce image-based installations that reinforce depictions of the past as experiences in the present. He studied at Massachusetts College of Art and Design (BFA, 2001), the School of the Art Institute of Chicago (MFA, 2007), the Skowhegan School of Painting and Sculpture (Class of 2010) and a completed a 2009-10 DAAD (German Academic Exchange Service) Scholarship for Fine Arts in Leipzig, Germany. Most recently, he participated in group exhibitions at the Elizabeth Foundation for the Arts, NYC and the Mills Gallery at the Boston Center for the Arts. Other exhibitions include curatorial project entitled “All Our Tomorrows and Yesterdays” at Proof Gallery in Boston (November 9–December 14, 2013) a group exhibition of the same name at Kunstverein Weiden in Germany (October–November 2012), and a solo show at 92Y Weill Gallery entitled “The Luxury of Distance” (March–May 2012). His work has been profiled and reviewed in Temporary Land Bridge, Hyperallergic, Big Red & Shiny, ARTnews, The Boston Globe, TimeOut Chicago and Paper & Carriage. He currently lives and works in Boston, MA.